Leonard R. Worthington, the son of Charles and Rosa Worthington, was born in Lecompton, Kansas, on January 14, 1926, where his father was a farmer. He was a standout athlete at Berryton High School, playing baseball, football and basketball. Worthington enlisted with the Marine Corps following graduation in 1944. He served in the Pacific Theater with the 6th Marine Division, and was at Okinawa in 1945. Only 340 miles from mainland Japan, Okinawa was the final amphibious landing of the war. It was also the largest in the Pacific campaign and proved to be the bloodiest. The 6th Marine Division landed at Okinawa on April 1, 1945, and met no resistance, even though the island was defended by an estimated 100,000 Japanese. But that was soon to change. Sugar Loaf Hill was a small, insignificant-looking mound of coral and volcanic ash on Okinawa. It was 50-feet high and 300 yards long, situated on the southern end of the island. The 6th Marine Division was given the task of taking the mound, and it would prove devastatingly costly. By the time the area was secured, 1,656 Marines would be dead and another 7,429 wounded. Corporal Worthington's squad leader and many of his buddies were killed at Sugar Loaf Hill. During the heat of the battle, on May 13, Worthington was severely wounded and reported missing in action. When he was finally found, he was shipped to Guam for hospitalization. That wasn't the end of his time as a Marine. Once he was sufficiently recovered, and following the Japanese surrender, Worthington was re-assigned to the 4th Marine Division, which was in Tsingtao (now Qingdao), China, to assist the Chinese government with the surrender and disarmament of Japanese troops. During the summer of 1946, in China, Worthington had the opportunity to play baseball with his outfit's team. Len Worthington returned to the United States, badly scarred; both physically and emotionally. He had seen the horrors of war that no 19-year-old should ever have to face, and he decided to give professional baseball a try. In 1947, he was pitching for an American Legion team in Topeka, Kansas, when he was scouted by the local team, the Topeka Owls of the Class C Western Association. The Owls gave the right-handed curve-ball specialist a contract and assigned him to the Miami Owls of the Class D K-O-M League. As the youngest member of the pitching staff, at just 21, he made 31 appearances and won 15 games against 11 losses as the Owls took the K-O-M League championship. Worthington went to work for the Atchison, Topeka and Santa Fe Railroad during the off-season and, after is strong performance for Miami in 1947, looked forward to advancing to the Topeka Owls in 1948. He joined the Topeka club for spring training, but was sent back to Miami for the regular season. After a couple of appearances, a disillusioned Worthington, quit professional baseball and returned to his railroad job, playing semi-pro ball with the Decker Oilers. He worked for the railroad for 32 years, and later worked as car salesman for Laird Noller Ford in Topeka. Len Worthington passed away in Berryton, Kansas, on October 25, 1984. He was 58 years old and is buried at Lynn Creek Cemetery in Berryton. "Leonard is now with his buddies whom he grieved for so many years," said his family. "He could never forget them and the way they fought for their county." 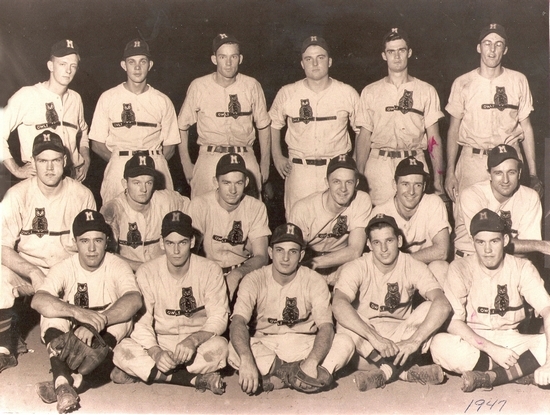 Thanks to John Hall for help with this biography and for the photo of the 1947 Miami Owls.